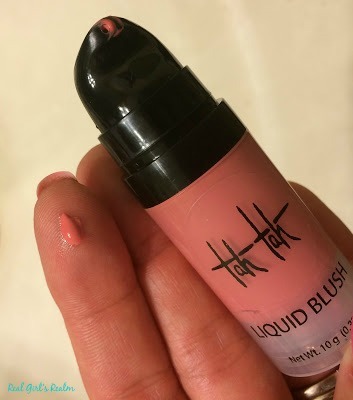 I love trying new brands of makeup, and when I came across Tah Tah Makeup on Instagram, I had to check out their website! Their makeup is manufactured in the U.S. at private label manufacturing companies. They offer products that are high quality, affordable, and 95% paraben free (excluding the eyeliners). Tah Tah has two professional makeup artists on hand that teach lessons, do makeovers, and work on productions. The best part, is that they are based out of Charlotte, NC which is near where I live! 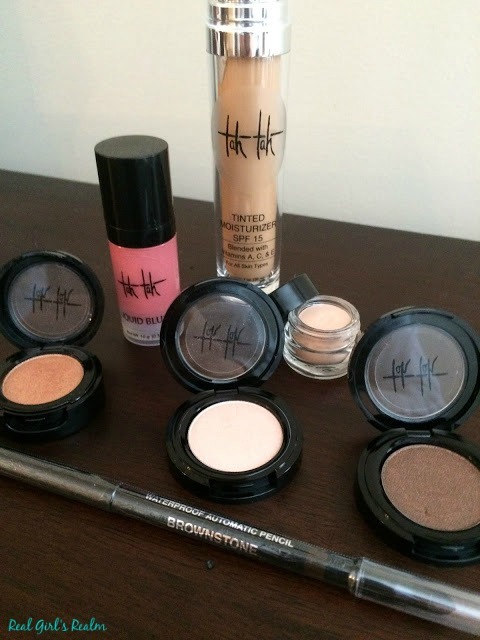 Heather at Tah Tah Studio was so easy to work with and sent me the perfect products and colors for my skin type. When I received my package, I was already impressed! It came wrapped nicely in purple tissue paper with a handwritten note included. I received a variety of items to review, including foundation, liquid blush, eye primer, three eye shadows, and eyeliner. Tinted Moisturizer w/ SPF 15: Touch of Sand - This is a sheer coverage foundation that does not dry out my skin. I used it with my current BB creme to get an even look. Liquid Blush: Flutter - I have to confess that this is my fist experience using a creme blush and I love it! I have dry skin, and sometimes the powder blush highlights the dryness. I used a couple of small dots on my cheekbone and blended it with my fingers. It did not take me long to get the hang of it and I love the subtle flush it gives me! Eye Primer: Pearl - I have only recently started using primers, although I have needed to because my eye shadow usually disappears by lunch! This primer kept my eye makeup in place all day, even after a full day at work and a yoga class. It is definitely a must have in my book! 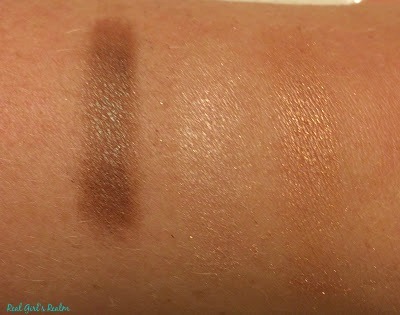 Eye Shadows: Booty, Prophecy, and Tremor - These shadows glide on easily and are very pigmented. I was also happy that this formula has minimal fall out. These three neutral colors complimented my blue eyes perfectly and stayed in place all day. Automatic Eyeliner: Brownstone - This eyeliner glides on like a cross between a liquid and a pencil. It is easy to work with and has a sponge tip on the opposite side for no-mess blending. This is one of my favorite eyeliners ever! It did not transfer onto my lid and it lasted all day. If you subscribe to their email, you can get great Pro Tips delivered to your inbox! Have you thought about using your eye shadow as eyeliner by wetting your brush or using your bronzer as blush, contour AND eye shadow? I can always use tips on how to multitask with my current makeup! I have been wearing this makeup almost daily for over a month and I can honestly say I loved all of the items I received and will definitely be purchasing more of this brand in the future! Disclosure: I received these items free to review, but all opinions are my own. I haven't heard of this brand before but those eye shadows look very pretty!! It is a great brand! I love all the products I received! Yes! I was so glad to be able to collaborate with them and discover a great new brand! I haven't heard of this brand and will need to check them out! The blush and eyeshadow shades are so pretty! Your makeup looks flawless! Jill, Thank you so much for your comment! 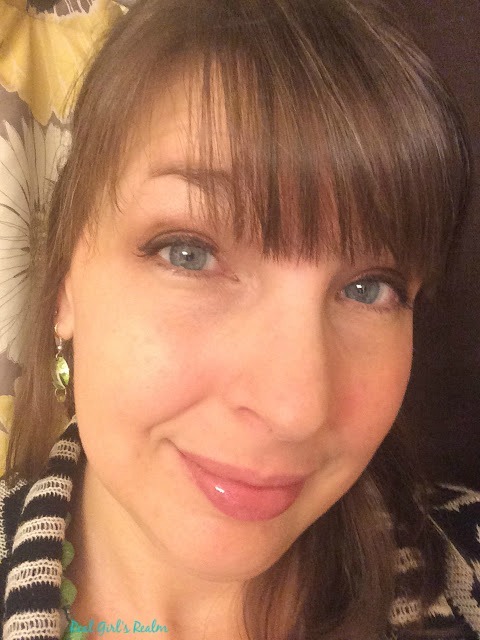 The makeup is great quality and the shades they sent me were perfect for my skin. You should definitely check them out! I haven't heard of this brand before, good to know you are happy with them. Thank you for your comment! Yes, the colors are neutral and are perfect for a natural makeup look!